Off-road racer Kyle LeDuc jumped, slid, and pushed his Ford Raptor Pro 4 race truck to another victory this weekend, and is now officially tied for Pro 4 Unlimited class wins in the history of the LOOR Racing Series with 26 titles. 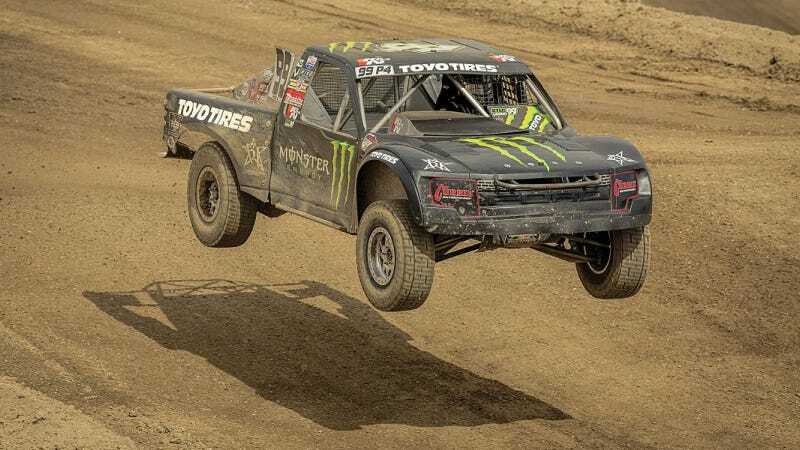 "Team Toyo® Off-Road driver, Kyle LeDuc made history this past weekend when he swept the Reno Off-Road Nationals at the Wild West Motorsports Park in Reno, NV. Winning both Rounds 5 and 6 at Reno, LeDuc is now tied with Carl Renezeder for the most ever Pro 4 Unlimited class wins (26) in the history of the series. This is LeDuc's second consecutive sweep this season in the Lucas Oil® Off Road Racing Series (LOORRS), having swept Rounds 3 and 4 at the Lake Elsinore Motorsports Park in Lake Elsinore, CA in late April."